All Seasons Pest Control went to visit a customer in Long Valley today, whose beautiful pine barn had been attacked all last summer by carpenter bees. We provided a full inspection and noticed in addition to carpenter bees there were signs of a carpenter ant and a mice infestation. Carpenter bees like soft untreated wood so painting or staining is important this time of year to slow their progress. However these bees are persistent and will find even the smallest bit of untreated wood to make a nest in. We are happy to provide education and remediation of carpenter bees when a home becomes infested. We see same day reductions from these annoying bees. Carpenter ants prefer to excavate wood softened my moisture and so it is important to stay ahead of any leaks that may spring from tough winters. This winter very tough on homes and a lot of moisture has been present in homes. Broken gutters from ice, wind blown shingles and the list goes on. Moisture is one of the most pest inducing problems in a home. 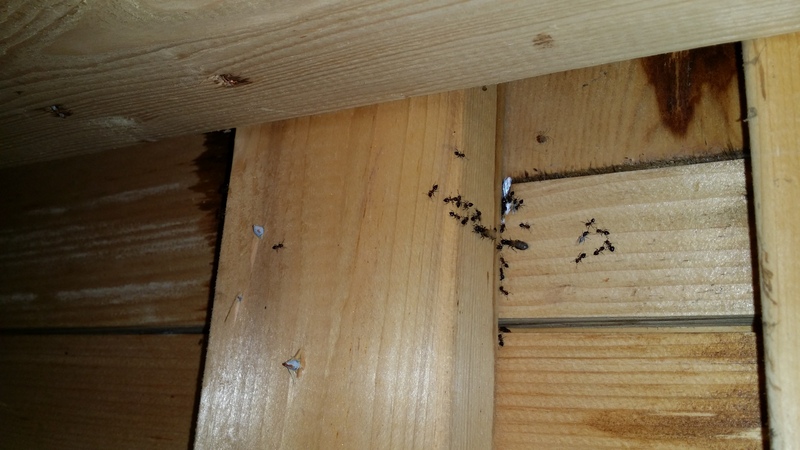 Water damage from a brutal winter always means more Carpenter Ants. As the wood begins its slow decay the carpenter ants are not far behind. Don’t let the ants get a hold. A few ants turns in to hundreds then thousands. Beyond being unsightly in your home they do damage that can go unseen for years! Regular maintenance will help avoid an infestations of wood destroying insects, but these insects work quickly and inevitably carpenter bees and ants will find the weak point in your wooden structure so it is important in addition to regular maintenance to work with a local, knowledgeable, pest management professional to develop an integrated pest management program that will address pests specific to your area, structure type and situation. A preventive pest control plan is key to keeping away wood destroying insects and rodents especially in wooden buildings. At All Seasons Pest Control we are happy to talk to you about remedying an integrated pest management plan to meet you needs, we look forward to your call.